Early one March morning in 1888, a 4-cubic-kilometer chunk of the Ritter Island volcano collapsed into the Bismarck Sea northeast of New Guinea. This volume of land was about twice that of the Mount St. Helens landslide in 1980, and it is the largest historically recorded tsunami-causing volcanic sector collapse. The ensuing landslide triggered a tsunami tens of meters high. The waves were still 8 meters high when they reached parts of the island of New Guinea that are several hundreds of kilometers away, according to observers who witnessed the event [Ward and Day, 2003]. Volcanic islands are the source of some of the world’s largest landslides. These landslides have the potential to generate large tsunamis. Scientists have debated the magnitude of these tsunamis, but much uncertainty remains over landslide dynamics and how far a tsunami can travel across an ocean basin while remaining large enough to cause damage. Studies of Ritter Island’s landslide and ensuing tsunami could significantly reduce that uncertainty. During a 6-week-long expedition in November and December 2016 aboard the German R/V Sonne, we mapped the Ritter Island collapse scar and deposit using hull-mounted multibeam sonar systems, which produced high-resolution bathymetry (Figure 1) and acoustic backscatter data. We are using data from this expedition, alongside a range of direct observations and samples, to generate a detailed interpretation of the Ritter Island landslide. With these robust field data, we set the stage for testing coupled landslide-tsunami models. Ritter Island’s historic landslide, along with a heightened awareness of tsunami hazards following several recent devastating events, has caused some to wonder if other volcanic islands could experience flank or total collapse and, if so, how far tsunamis could reach. One hypothetical scenario that captured the attention of the popular media in 2004 involves a potential collapse of the Cumbre Vieja volcano on the southern half of the island of La Palma, one of the Canary Islands off the northwest coast of Africa. Such a collapse could trigger a tsunami that races across the Atlantic Ocean. However, recent tsunami models span an order of magnitude in their predictions of far-field wave heights for the La Palma collapse scenario. Resolving such discrepancies in our understanding of landslide and tsunami processes requires a field data set in which both phenomena can be observed to test current models. The sector collapse of Ritter Island, Papua New Guinea, in 1888 meets both these criteria. The landslide generated a tsunami that devastated shorelines as far as 600 kilometers away [Day et al., 2015]. An important factor is that there are eyewitness observations of the tsunami height, arrival time, and frequency at a range of locations around the Bismarck Sea [Day et al., 2015]. The event can thus be used as a benchmark for testing models of landslide-generated tsunamis if the volume, distribution, and dynamics of the landslide mass can be reconstructed. Fig. 1. (a) Three-dimensional view of the Bismarck Sea between Umboi and Sakar islands compiled using data from the SO-252 multibeam echo sounder, bathymetric data from the General Bathymetric Chart of the Oceans (GEBCO), and altimetry from the Advanced Spaceborne Thermal Emission and Reflection Radiometer (ASTER) satellite. The gray transparent cone represents Ritter Island before the 1888 event. Black lines and the red box indicate 2-D and 3-D seismic reflection data, respectively, acquired during the SO-252 expedition. The white arrows here and below indicate the direction of material mobilization during the 1888 event. 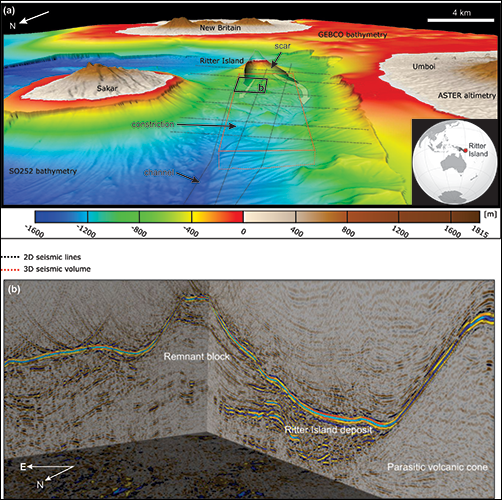 (b) Three-dimensional reflection seismic data (from the area in the red box above) showing the Ritter Island deposit, remnant block, and parasitic volcanic cone. No image credit. Ritter Island is located north of Australia in the Bismarck Sea about 80 kilometers north of New Guinea and some 20 kilometers off the western end of New Britain. Situated between the islands of Umboi and Sakar (Figure 1), it forms part of the Bismarck Volcanic Arc, which results from the northward subduction of the Solomon Plate underneath the Bismarck Plate [Baldwin et al., 2012]. Today, Ritter Island is a narrow, crescent-shaped island, around 1.2 kilometers long and 200 meters wide, reaching an elevation of approximately 140 meters above sea level. This island is all that remains of a larger, steep-sided conical island that was around 750 meters high before it collapsed in 1888 [Day et al., 2015]. 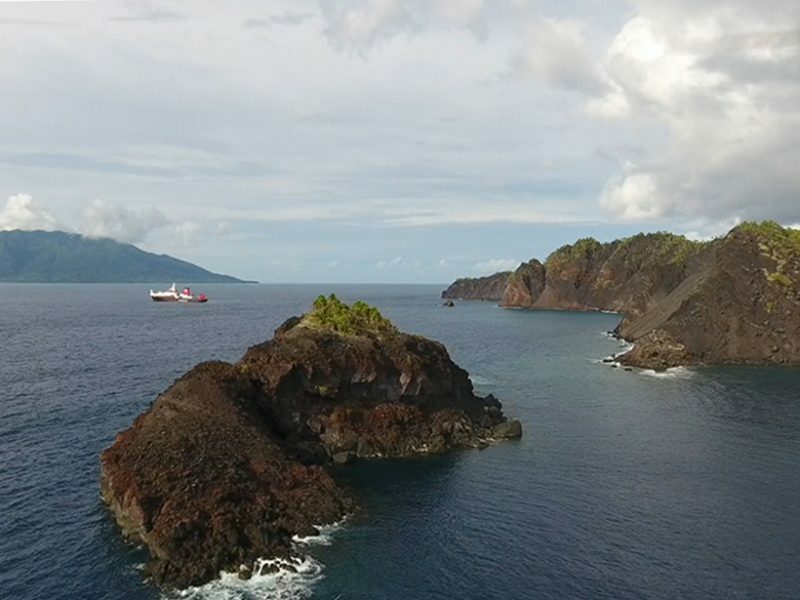 During the 19th century, Ritter Island was known among navigators in the region as a highly active volcano, characterized by frequent Strombolian activity [Johnson, 2013]. There is evidence for several submarine eruptions since 1888 that have constructed a cone with a current summit around 200 m beneath sea level. The remnant of the island above the waterline is dominated by interbedded sequences of basaltic scoria and thin lava flows that are consistent with low-level Strombolian activity. This arc is all that remains of the Ritter Island volcanic cone. Underwater deposits show clear evidence of the landslide triggered by the collapsing cone, and eyewitness accounts described the resulting tsunami. Credit: Christian Berndt. Contemporary observations of the tsunami triggered by the 1888 event suggest a single wave train, which is consistent with one main phase of landslide movement and tsunami generation [Day et al., 2015]. The landslide deposit is young enough to be preserved at the seafloor without significant overlying sedimentary cover, so it can be examined today to understand the emplacement dynamics of a large volcanic island landslide. Volcanic island landslides with volumes of 1 to 10 cubic kilometers, such as the Ritter Island landslide, have a global recurrence interval of 100 to 200 years [Day et al., 2015]. Therefore, a similar event is likely to occur in the next 100 years, in contrast to the extremely large ocean island collapses (e.g., Canary Islands and Lesser Antilles) that have recurrence intervals of tens of thousands of years or more. During our 2016 expedition, we used a Parasound subbottom profiler with 10-centimeter resolution, as well as 2-D multichannel seismic data and P-Cable 3-D reflection seismic data acquisition systems to image the collapse deposit with 5-m vertical and horizontal resolution (Figure 1). Additional observations and samples collected across the deposit and island flanks, using towed video cameras and sediment samplers, provide ground truthing of the geophysical data and allow us to construct a detailed interpretation of landslide emplacement processes. These are key parameters for determining the landslide failure and emplacement process and the dynamics of the 1888 tsunami. An initial assessment of the data indicates that the flanks of Ritter Island below sea level expose clastic sequences similar to those in the scar above the water, with an increase in more massive lava units in the lowermost part of the edifice. 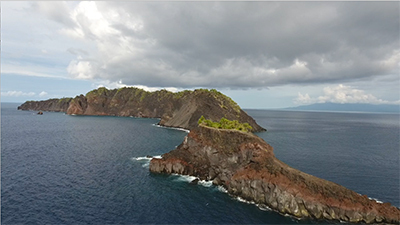 The landslide cuts deeply into the island structure, and the scar exposures suggest an edifice that is dominated by loosely compacted layers of volcanic rock fragments. The landslide mass split and flowed around a remnant block of the island and dispersed within the channel between Umboi and Sakar (Figure 1), where it formed a deposit that is relatively flat at the margins and has irregular channelization in the central part. Parts of the landslide deposit traveled through a constriction between Umboi and Sakar and incorporated underlying seafloor sediment. Our observations indicate that minor changes in slope gradient can strongly affect landslide dynamics. The deposition of the Ritter landslide entailed a progressive, multiphase, brittle to plastic failure that mobilized material over a considerable distance. The distal deposit, near the leading edge of the landslide, incorporates a major proportion of underlying seafloor sediment. Seismic profiles through the distal deposit indicate that the 1888 landslide was only the latest of a series of large-volume volcanic landslides from the surrounding islands. Some blocks piercing the seafloor are, in fact, rooted within older and much larger landslide deposits. How large a tsunami a volcanic collapse landslide of a given size will generate and how far the tsunami will travel before it dissipates remain open questions. 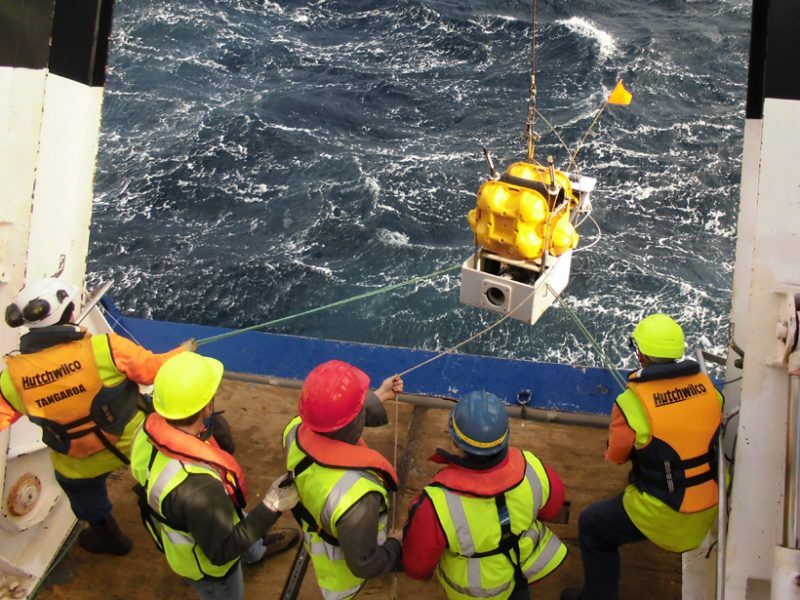 The information we gathered on this expedition will provide the framework for coupled landslide-tsunami models, which are required to assess the destructive potential of sector collapse–related tsunamis. This work reflects the joint effort of the SO252 expedition’s shipboard scientific party. We thank Simon Day, Eli Silver, and Russell Perembo for sharing data and helping with the survey planning. We thank the master and crew of R/V Sonne and our technicians for support during the cruise. Data collection was funded through the BMBF project Ritter Island 03G0252A. A.M. acknowledges funding from the European Research Council under the European Union’s Horizon 2020 Programme (MARCAN, grant agreement 677898). Baldwin, S. L., P. G. Fitzgerald, and L. E. Webb (2012), Tectonics of the New Guinea region, Annu. Rev. Earth Planet. Sci., 40, 495–520, https://doi.org/10.1146/annurev-earth-040809-152540. Day, S., et al. (2015), Submarine landslide deposits of the historical lateral collapse of Ritter Island, Papua New Guinea, Mar. Pet. Geol., 67, 419–438, https://doi.org/10.1016/j.marpetgeo.2015.05.017. Johnson, R. (2013), Fire Mountains of the Islands: A History of Volcanic Eruptions and Disaster Management in Papua New Guinea and the Solomon Islands, ANU Press, Acton, Australia, https://doi.org/10.26530/OAPEN_462202. Ward, S. N., and S. Day (2003), Ritter Island volcano—Lateral collapse and the tsunami of 1888, Geophys. J. Int., 154, 891–902, https://doi.org/10.1046/j.1365-246X.2003.02016.x. Citation: Micallef, A., S. F. L. Watt, C. Berndt, M. Urlaub, S.Brune, I. Klaucke, C. Böttner, J. Karstens, and J. Elger (2017), An 1888 volcanic collapse becomes a benchmark for tsunami models, Eos, 98, https://doi.org/10.1029/2017EO083743. Published on 10 October 2017. For the past year, Tara Hutchinson has been trying to figure out what will happen to a tall building made from thin steel beams when “the big one” hits. Credit California’s Northridge earthquake for helping set this in motion. The 1994 quake, centered near Los Angeles, killed 72 and cost an estimated $25 billion in damages. In its aftermath, a report commissioned by Congress warned that the country needed a more systematic approach to studying how to reduce damage from earthquakes. NSF responded with the $82 million Network for Earthquake Engineering Simulation. The money funded a construction spree at 14 sites around the country. Another $200 million paid for operating the sites through 2014. That included UC San Diego, which unveiled the world’s largest outdoor shake table in 2004. The results aren’t just of academic interest. Sponsors of the test include manufacturers of the steel construction parts, the insurance industry, and state government. “There’s nothing like a full-scale test,” says Richard McCarthy, executive director for the Cali–fornia Seismic Safety Commission in Sacramento, a government commission that advises policymakers. It contributed $100,000 to the event, he says, partly with an eye toward potential changes to building codes governing construction using these materials. Abstract: Light-gauge cold-formed steel (CFS) framed multi-story residential housing has the potential to support societies urgent need for low cost, multi-hazard resilient housing. CFS-framed structures offer lower installation and maintenance costs, are durable, ductile, lightweight, and manufactured from recycled materials. In addition, consistency in material behavior and low material costs are added benefits compared with their wood-framing counterparts. The components of CFS-framed assemblies (studs, track, joists) can be assembled quickly and with relative ease into prefabricated panels. Notably, the ductile nature of a CFS-framed structure aligns with the performance needs in moderate to high seismic zones. Compared to other lightweight framing solutions (such as timber), CFS is non-combustible, an important basic characteristic to prohibit fire spread. Taken in totality, these many beneficial attributes lead to a highly sustainable infrastructure for housing communities. 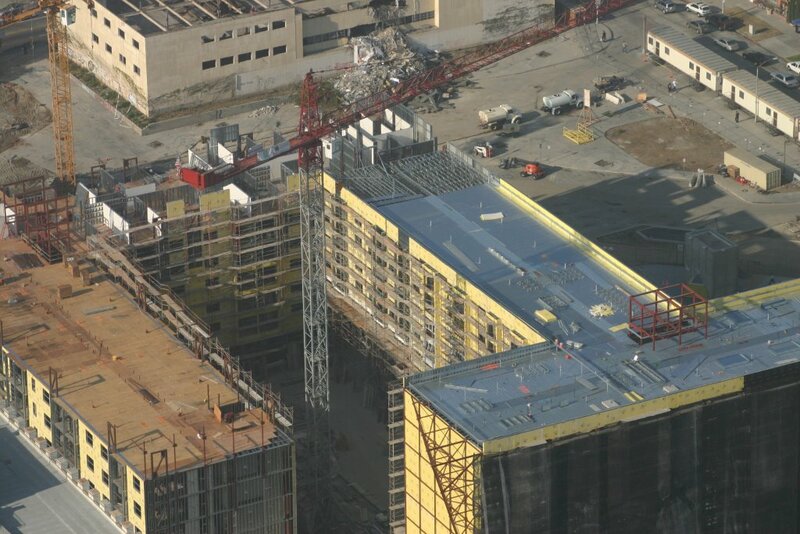 This research aims to evaluate the earthquake and post-earthquake fire performance of mid-rise CFS-building systems through full-scale earthquake and live thermal testing of a 6-story wall-braced system. Through partnership with cold-form steel and other materials suppliers, design engineers, and insurance entities, a unique experimental program is underway. 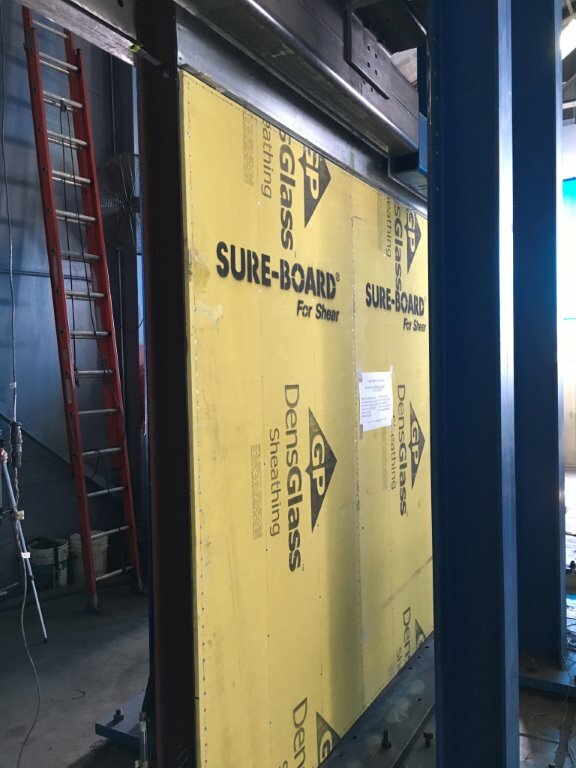 Central to this effort is the construction of a full-scale portion of a 6-story CFS-wall braced building directly on the UCSD Large High Performance Outdoor Shake Table. Wall and floor systems for the building are assembled in a panelized fashion off-site, thus the overall erection time of the building is dramatically reduced. The test building will be subjected to low amplitude white noise motions and sequentially increasing in amplitude earthquake motions. Subsequently, live thermal tests will be conducted on two floors of the building, in corridor and room like spaces strategically designed to investigate thermal patterns that develop due to reduced compartmentation ensued during the earthquake motions. “There seems to be a link potentially with where these really shallow slow slip events happen and where tsunami-generating earthquakes happen,” said Laura Wallace, a research scientist at the University of Texas at Austin. Wallace is the lead author on a paper* published yesterday in Science about the new observations. In undersea trenches in many parts of the world, one of the Earth’s tectonic plates pushes beneath another, or subducts, in an inching, lurching process that builds up stress in the subduction zone that can catastrophically release as an earthquake, which in turn can trigger a tsunami. However, in slow-slip events that are common at subduction zones, sliding of the plates at a more rapid pace than usual (although still much slower than the sudden shift of an earthquake) relieves stress in the fault zone over a period of typically days to months.